The Anson Engine Museum and the Doxford Engine Friends Association (DEFA) have joined forces to appeal for donations to save the huge single cylinder engine that until now has been located at the Department of Marine & Mechanical Engineering, South Tyneside College, South Shields. The College is replacing the engine with a more modern high-tech diesel marine engine and for several months had been in negotiations with a party who was going to rehouse the engine. One week before dismantling was to take place the deal fell through and it was feared that the Doxford, which has been at the college since 1969, might have to be dismantled and sold for scrap. Geoff Challinor contacted The Fund for the PR eservation of I ndustrial and S cientific M aterial (PRISM) to request a grant towards the costs and with that, the help of the college, and a donation from the City of Sunderland, plans to rescue the engine and transport the pieces down to Poynton in Cheshire could begin. The huge logistical problem of dismantling the 32 foot high engine, tagging (for later reassembly) and moving the 100 tons of engine parts has now started. To help towards the costs of the move, the preparation of a suitable site at the museum and later reassembly work, the museum has started a "Save the Doxford" fund via the link on this page or use the donation form below. Donations of any size are welcomed from the public and from commercial companies who would like to help save this fine example of British workmanship, possibly the last working Doxford engine in the world. It is going to cost many thousands of pounds to even transport the engine to its new location. Geoff Challinor, Chairman of the museum said: "The level of interest and support we have already received is fantastic. At very short notice the PRISM grant committee gave us an answer to our request and the college have been tremendous in donating the engine and a large part of its dismantling costs. Thanks to a request from the Doxford Friends, we have already had a boost of £3,000 from the City of Sunderland. This huge groundswell of support tells us that a great many people believe, as do we, that such an important part of our heritage should be preserved and made available to the nation." The engine is the largest single cylinder internal combustion engine to be preserved in the UK. It has a unique opposed piston design and, when reassembled to running order, will be the only running survivor of this type in the world. It was used by The Doxford Engineering Company from 1956 at their Palmers Hill works in Sunderland, for the testing of newly designed parts to be used on existing and new engines. 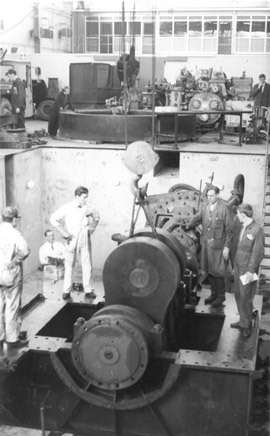 It paved the way for the development of the P and J engines that were to transform marine diesel engines and the fortunes of the works throughout the 50s and 60s. 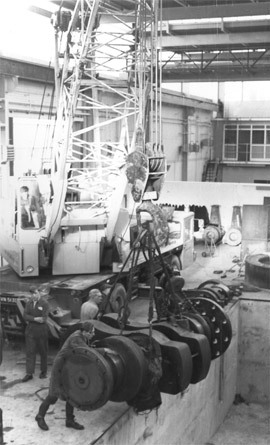 In 1966 the experimental department was moved to the main engine works at Pallion in Sunderland so the engine was donated to South Shields Marine College (now know as South Tyneside College) to train marine engineers from all over the world. South Shields, learning how to strip, lubricate, re-assemble and run this lumbering giant. It is an excellent and unique example of this era of marine engineering. As well as being run as part of their engineering studies, the students run the engine twice a year for members of the Doxford Engine Friends Association www.doxford-engine.com. So what is a Doxford Engine? It's a special type of engine used for powering large ships. Ships powered by Doxford Engines imported cargoes such as iron ore from Spain, Australian Lamb, butter from New Zealand, wheat from Canada and bananas from the Windward Islands. They delivered manufactured goods from Britain to worldwide markets. Many Doxford Engines were very big - the size of several three-storey terraced houses! 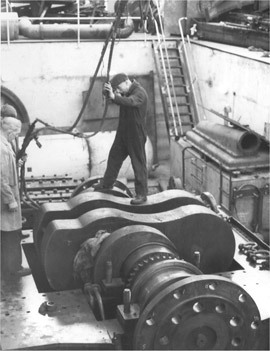 The largest have cylinders bigger than four dustbins stacked end to end, and each of these cylinders is as powerful as two or three Spitfire engines. Most Doxford oil engines made after 1954 could run on cheap 'heavy oil', a thick, tarry by-product of oil refineries. Doxford engines are an important British innovation; the first one was tested in 1914, and the last one was built in 1980. Doxford engines were developed in Sunderland, but they were also made on Tyneside, on Clydeside and in several countries abroad. Hundreds of people worked at the Doxford Engine Works in Sunderland, designing, building, installing, repairing, and making spare parts for the engines to keep them running. It is little known that one third of all merchant ships built in the UK were built on the river Wear in Sunderland. Most of these ships were powered by the famous 3-cylinder Doxford Economy Engine which saved Britain from starvation during the Second World War. They had to run at full speed to keep up with the convoys in the North Atlantic using only six tons of fuel per day. If this engine had not existed, it is likely that Britain would have been forced into submission by Germany due to starvation. Thank you for your help to save this magnificent engine. Built on the site of the old Anson Colliery this award winning museum has a great deal to offer visitors.